Before Golden Rice is exported to a country, a risk assessments package is submitted to the approving authority in the receiving country according to the Cartagena Protocol on Biosafety . Name and identity of the GMO (event number, OECD unique identifier, etc), including domestic classification, if any, of the Biosafety level of the GMO in the exporting country. Rice is grown worldwide and is a staple food for about half of the world's population. The centre of diversity is thought to include the stretch from Assam in India and Bangladesh to Myanmar and Northern Thailand through to the Yunan Province in China. This zone has both topographical and hydrological heterogeneity. Cocodrie is a variety that is registered by Louisiana State University, USA. Rice is an autogamous self-pollinating crop, replicating sexually through seeds and vegetatively through tillers in favourable temperature and water conditions. The life (viability) span of the pollen is short (3-5 minutes) and the majority of cultivated rice does not have stigmas that exert beyond the glumes. Rice is grown as an annual crop with a generation time of 4-6 months. A second crop can sometimes be obtained from the tillers or ratoon, under favourable water and temperature conditions. With regard to human health rice contains endogenous allergenic proteins. They are present in the albumin and globulin fractions of rice endosperm proteins and have significant homology with the alpha-amylase/trypsin inhibitor family from wheat and barley. Rice pollen, like pollen from all other plants can cause allergic reactions in susceptible individuals, when inhaled. Narcissus pseudo­narcissus Daffodil Widespread in the environment. Daffodil bulbs are toxic to animals and humans if ingested and can cause contact dermatitis. Entero­bacteriacae Erwinia uredovora	Syn: Pantoea ananas A common plant pathogen of fruits and vegetables causing soft rot diseases. Pectate lyases from Erwinia species share sequence similarity with the common allergen Amb alpha II. Agrobacterium tumefaciens syn: Rhizobium tumefaciens Crown gall	 Tumorigenic strains of Agrobacterium causes crown galls diseases. The strain used in non-tumorigenic. The sequences used are non-coding, so no protein product is produced that could cause toxicity, allergenicity or pathogenicity. Oryza sativa	 Rice Widespread in the environment and human and animal diets. No known toxicity or pathogenicity associated with the donor organism. Some susceptible individuals are allergic to rice. Pisum sativum Pea Widespread in the environment and human and animal diets. No known toxicity or pathogenicity associated with the donor organism. Agrobacterium-mediated transformation with a superbinary vector plasmid was used to introduce the plant and bacterial sequences into the rice plants to deliver accumulation of carotenoid in rice endosperm tissues. The specific and intended effect of the modification is to produce transgenic rice plants that have carotenoids expressed in the rice endosperm, where non previously existed. The environment into which the transgenic rice plants will be introduced is a typically agricultural environment in the country listed above. Rice can establish itself outside the agricultural environment, which is illustrated by the establishment of weedy rice or red rice (O. sativa f. spontanea). In practice, the prevention of weed infestation by the weedy rice is managed by planting seed that is free of red rice and cultural methods are used to control its incidence. India is a centre of origin for rice, with common wild rice species such as O. rufipogon, O. nivara present as well as cultivated japonica and indica species. O. rufipogon is widely distributed throughout Asia and present in the majority of Indian states. The intended use of the GMO is for research purposes to allow the evaluation and compare the agronomic fitness and carotenoid composition of each line. Up to 500 g of seed of each line. a. Consistent with Annex II of Directive 2001/18 for exports out of the EU. b. According to Annex III of the Cartagena Protocol on Biosafety for other relevant movements. There are no specific differences between the seed and plants of the rice events compared to traditional rice except for the accumulation of carotenoids in the rice endosperm. Rice is widely grown commercially and therefore it is proposed to use similar practices as would be used for traditional rice varieties. Storage will be in a secure location, with the labelled seed bags only being opened on the day of sowing. Sowing will take place under supervision of the trials officer. Excess seed will be returned to seed store in labelled bags and returned to sender or destroyed. The seeds will be packed and transported in such a way that no seed will escape. The seed will be sent in a sealed container, which will be placed in a second sealed container. The seed of the transgenic rice can be visually distinguished as they have a yellow colouration to the grain. Traditional PCR techniques can be used to detect the genes of interest in the transgenic plants. These are research samples and as such event-specific detection methods have not yet been developed (as required for commercial release). The events listed are research samples and have not received any regulatory approvals in the country of origin. All work that has been carried out in the UK has been in accordance with EC Directive 90/219 and amendments. The events have been imported from the UK to the USA (Import permit from USA 03-266-04N) and released into the field in the USA in 2004 (Permit Number 04-036-01N (SYN2004 -102). Purpose is for small-scale field trials for evaluation of agronomic characteristics of the lines in the field under the different growing conditions and to compare the agronomic fitness of each line. Likelihood of the GMHP becoming more persistent than the recipient or parental plants in agricultural habitats or more invasive in natural habitats. Rice is planted and harvested as an annual crop. Wild populations with which it could cross-pollinate are minimised by agricultural practice, as is red rice, or weedy rice, which can establish itself outside agricultural habitats. In the field red rice is controlled by cultural methods. The main form of dispersal is the seed, which may give rise to volunteer plants when there are favourable water and temperature conditions that allow germination. The introduction of the carotenoid biosynthesis pathway into rice endosperm will not render rice weedy or invasive of natural habitats as none of the reproductive or growth characteristics have been modified. This is a small scale research trial and as such will be carefully managed within a controlled environment with appropriate isolation distances to minimise gene flow to wild and weedy rices. In conclusion, no differences between the transgenic and non-transgenic rice plants have been observed to date with the exception of the effect of the accumulation of carotenoids, and therefore the reproductive and vegetative fitness of the transgenic events are comparable to the recipient variety. The rice plants have been modified to express the carotenoids biosynthetic genes in the endosperm by the introduction of two genes. There is a theoretical possibility that the accumulation of carotenoids in the grain endosperm could alter the attractiveness of the grain to pests. Phenotypic performance in the glasshouse and the reproductive and vegetative fitness described above shows no selective disadvantage to the transgenic plants. Potential for gene transfer to the same or other sexually compatible plant species under the conditions of planting of the GMHP and any selective advantage or disadvantage conferred to those plant species. Rice is generally considered a self-pollinator, however natural outcrossing can occur. Cultivated rice can cross easily with red rice or other rice crops to produce fully fertile hybrids. Rice pollen is short-lived and in cultivated rice the stigma does not protrude beyond the glumes. The distribution of pollen from its source decreases considerably with increasing distance (Messeguer et al., 2001). In small-scale field trials, management measures, such as isolation distance, are employed to prevent cross-pollination to either wild or weedy species of rice or cultivated rice in close vicinity of the trial site. In addition, there is no evidence that the viability of the pollen or other reproductive characteristics are changed compared to the recipient rice plants, thus no alterations in outcrossing potential are expected. Dispersal can also occur through the seed stage. Careful measures will be undertaken with regards to handling and storage of the seed. There are no target organisms. The inserted genes are isolated from naturally occurring organisms that are already widespread and prevalent in the environment, namely daffodil(Narcissus psedonarcissus), the soil bacterium Erwinia uredovora (syn Pantoea ananatis) and a non-pathogenic strain of E. coli. Direct, immediate effects could arise from potential genetic instability or gene silencing which could cause the transgenic rice to revert to no carotenoid expression in the endosperm and hence be the same as unmodified rice. A large range of pests and diseases attack rice, with weed infestation being one of the most important sources of economic crop losses. One of the main weed species is weedy rice (O. sativa). In a rice field there are also beneficial predators and parasitoid species such as spiders, grasshoppers, ants, wasps and beetles that seek out eggs and larvae of pests. Integrated pest management solutions are often the preferred choice, as the use of pesticides can kill the natural predators, leading to an increase in the pest populations. The introduction of genes from the carotenoid biosynthetic pathway is unlikely to affect the populations of beneficial predators or parasitoids. Interactions with other organisms are largely limited to the agricultural environment. Rice seed could shatter before or during harvest and be moved off site by birds and rodents. The rice varieties being used in the trials exhibit little or no dormancy and as such are likely to germinate quickly if the water and temperature regime are favourable, else the seed is unlikely to survive. Agronomic practices and crop rotations would be likely to contain the spread of volunteer seed and plants. An immediate direct effect could be through cross-fertilisation of the transgenic rice into weedy or other cultivated rice genotypes can growing in close proximity. Studies have shown that this can occur at very low frequencies, but measures will be taken in the design of trials to reduce this low frequency still further, such as isolation distances. In conclusion, the transgenic rice will have the same interactions in the environment as non-transgenic rice in this small scale research trial. These are small-scale research trials and as such all plants used in the release will be destroyed at the end of the trial and will therefore not be used as human food or animal feed. Rice itself is a well-known food for much of the world's population and has a long history of safe use. Rice contains a number of antinutrients, including phytic acid, trypsin inhibitor and a lectin. All antinutrients are concentrated in the bran fraction, and with the exception of phytic acid are heat labile. With regard to human health, rice contains endogenous allergenic proteins. They are present in the albumin and globulin fractions of rice endosperm proteins and have significant homology with the alpha-amylase/trypsin inhibitor family from wheat and barley. Rice pollen, like pollen from all other plants, can cause allergic reactions in susceptible individuals, when inhaled. The introduced genes are from daffodil and the soil bacterium Erwinia uredovora (syn Pantoea ananatis). Daffodils are known to be toxic by ingestion to animals and humans due to the toxic alkaloids that they contain and can cause skin irritation and allergy in workers handling daffodils and other members of the Amaryllidacea family. Erwinia uredovora (syn Pantoea ananatis) is a soil bacterium that is phytpopathogenic on a wide range of fruits and vegetables, causing soft rot diseases. The pectate lysase enzymes that are responsible for the pathogenic nature of the bacterial diseases caused by this species have sequence similarity with the AMB Alpha II allergen. Both the coding sequences of the introduced genes have been subjected to a search for homology with known allergens and toxins at an 8-aminoacid linear epitope level and no homology was found. In conclusion, the possibility that the introduced genes could have toxic or allergenic effects on human health as a result of this small-scale research trial is effectively zero. The trials in the importing countries will be small scale and all plants used in the release will be destroyed at the end of the trial and will therefore not be used as human food or animal feed. Rice products such as straw, bran and unpolished rice can be used as animal feed, but in practice it is rarely used as such, as it is high cost and low in nutritive value compared to other feeds. Rice polishings, a byproduct of milling, however, does provide a nutritious feed product. Mixtures of carotenoids are widely used as animal feed additives for organoleptic properties and as colourants. There is no reason to believe that there will be any effects on animal diets that are different to conventional rice. No direct, indirect, immediate or delayed effects on biogeochemical processes arising out of the interaction between the modified rice and non-target organisms can be envisaged. Cultivation and management techniques used for rice in the trials in the importing countries are the same as those used in normal trial practices in those countries. In conclusion, the environmental risk assessment concludes that the risk of potential adverse effects in the environment from small-scale research trials is effectively zero. 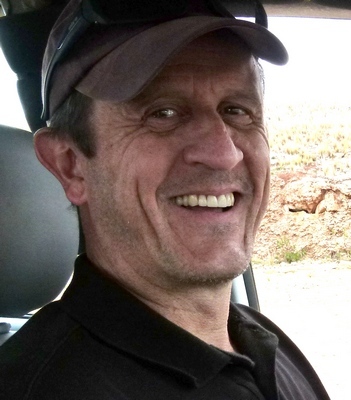 A long and winding road: the path from the lab to the field. 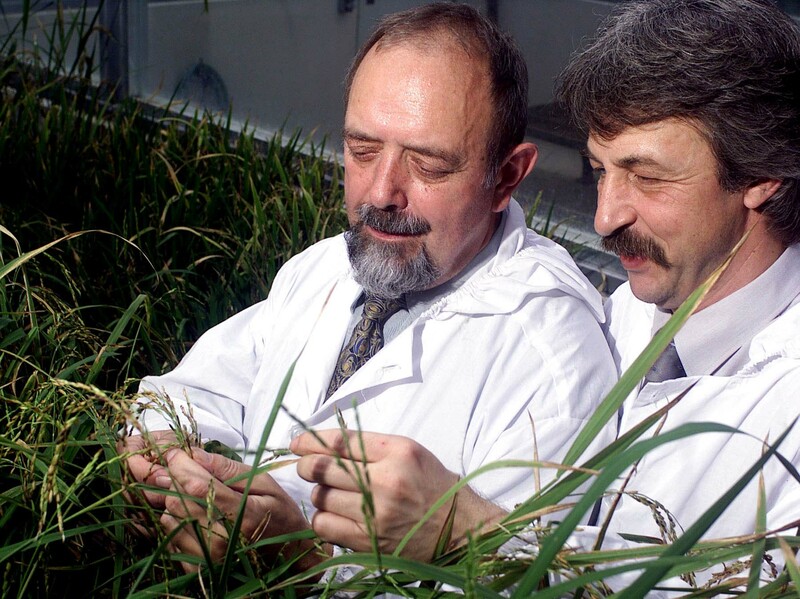 Golden Rice inventors Ingo Potrykus and Peter Beyer in the early days examining the agronomic behaviour of greenhouse-grown transgenic rice plants.